Search for all "cfp10 / esxB"
Rabbit anti cfp10 / esxB. Suitable for Western Blotting under Reducing conditions: 0.2-1 μg/ml. CFP10 (10 kDa culture filtrate protein) is a low molecular weight protein isolated from Mycobacterium tuberculosis culture filtrates. CFP10 and the 6 kDa early secretory antigen of T cells (ESAT6) are secreted in abundance by Mycobacterium tuberculosis and are frequently recognized by T cells from infected people. The genes encoding these proteins have been deleted from the genome of the vaccine strain Bacille Calmette Guerin (BCG). CFP10 is one of a small number of secreted M. tuberculosis proteins now identified, that appear to play key roles in tuberculosis pathogenesis and in the stimulation of immunity. Cole ST, Brosch R, Parkhill J, Garnier T, Churcher C, Harris D, et al. Deciphering the biology of Mycobacterium tuberculosis from the complete genome sequence. Nature. 1998 Jun 11;393(6685):537-44. PubMed PMID: 9634230. Arlehamn CS, Sidney J, Henderson R, Greenbaum JA, James EA, Moutaftsi M, Coler R, McKinney DM, Park D, Taplitz R, Kwok WW, Grey H, Peters B, Sette A: Dissecting mechanisms of immunodominance to the common tuberculosis antigens ESAT-6, CFP10, Rv2031c (hspX), Rv2654c (TB7.7), and Rv1038c (EsxJ). J Immunol. 2012 May 15;188(10):5020-31. Yang H, Chen H, Liu Z, Ma H, Qin L, Jin R, Zheng R, Feng Y, Cui Z, Wang J, Liu J, Hu Z: A novel B-cell epitope identified within Mycobacterium tuberculosis CFP10/ESAT-6 protein. PLoS One. 2013;8(1):e52848. PBS, pH 7.4 with 15 mM sodium azide as preservative. Liquid purified IgG fraction (> 95% pure by SDS-PAGE). 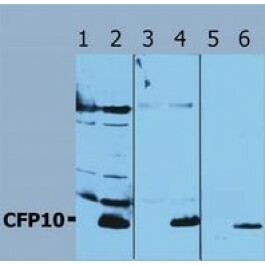 The polyclonal antibody reacts with CFP10 (LHP), a 12,3 kDa antigen encoded by gene Rv3874 of Mycobacterium tuberculosis. The antibody recognizes CFP10 of Mycobacterium tuberculosis H37Rv and Mycobacterium bovis; it reacts also with recombinant antigen produced in Escherichia coli.